The nation's leading newspapers, and The Sun, today revealed the results of a wide-ranging survey of one sample of handwriting. The graphology survey, the first of its kind to be published by those pretending to be journalists revealed that not only does the Prime Minister have bad hand-writing but that he is possibly the most evil man in history. The letter was sent to a grieving mother of a heroic soldier killed serving his country in Afghanistan. The Sun emphasised that the letter is further evidence that Gordon Brown should be burned at the stake. The family of the deceased were dismayed at the handwriting and the difficulty they had reading it, suggesting that for subject matter so sensitive perhaps a typed letter would have been more appropriate. These sentiments were echoed, repeatedly, by The Sun. Number 10 denied that they had ever contemplated sending a typed letter and that the hand-written nature of showed just how important writing to the family of those who have fallen for their country is to the Prime Minister. 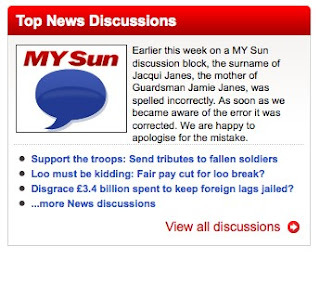 Gordon Brown has since apologised for any distress caused to The Sun newspaper. The angularity in his handwriting is a great indicator of what the article wants to say. This Handwriting academy in Bangalore, offers training and services in Grapho Psychology or Graphology handwriting analysis - Handwriting Analysis, Self Improvement, Handwriting Analysis Personality, Graphology Handwriting Analysis, Personality Development.